The US sales numbers for November are still coming in (Mercedes-Benz will report on Wed., due to a software glitch) and the reports confirm that pickup trucks and SUVs continue to pace the market. Sales for most of the larger manufacturers — Nissan, Ford, GM, and Chrysler — were up modestly, while Toyota reported a 12.4 percent increase for the month. 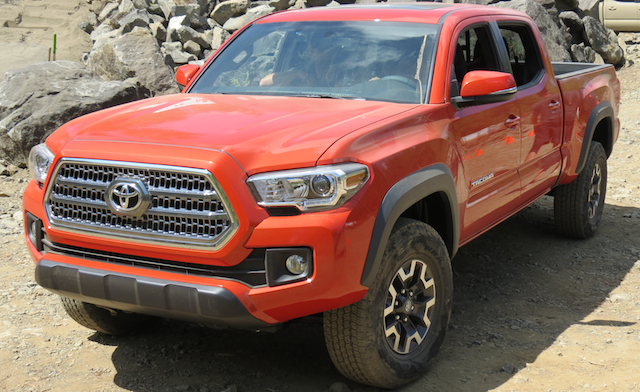 Nearly across the board, manufacturers with a strong truck and/or SUV presence were able to maintain momentum as we go into the final month of 2015. US auto sales this year are on pace to surpass the previous record 17.3 million units sold in 2000. It is a number few thought we’d reach again or as fast as seven years after the market collapsed. Analysts expect sales to increase again next year with some predicting 20 million annual units will eventually be attained. Fiat Chrysler wasn’t the sales leader, but the automaker managed to notch its 68th consecutive month of year-over-year sales gains. That streak began in spring 2010 and has not let up. Sales for FCA were up 3 percent, giving the company its best November in 15 years. The Jeep brand led all comers, registering a 20 percent increase for the month. FCA also recorded strong sales for the Dodge Challenger, Dodge Journey, and the Ram pickup truck line. Subaru sales continued to break records as the company recorded its 48th consecutive month of year-over-year sales gains. Subaru’s sales rose by 14 percent for the month and at the end of November the company had already reached its best sales year ever with December still to come. Forester and Outback remain the brand’s strongest products with Crosstrek sales contributing. Nissan set a new record for November, with the Nissan division selling 95,389 passenger vehicles for the month. Its Rogue crossover SUV was a hot seller with sales up 49.8 percent on 22,565 units sold. Neither of the brand’s two pickup trucks — Frontier and Titan — helped as sales for both vehicles fell in November. The good news is that a new Nissan Titan is on the way — Auto Trends will present an overview of the 2016 Nissan Titan later this month. Pickup truck and SUV rich GM continues to lead all comers. Sales were up a modest 2 percent for the month, but Chevrolet truck sales rose by 10 percent, representing the 20th consecutive month of sales increases. Chevrolet’s crossovers (but not including the traditional SUVs) surged by 35 percent, representing the 12th consecutive month of increases. Combined sales for the new generation Chevrolet Colorado and GMC Canyon midsize pickup trucks topped 100,000 units for the year as well. The Ford Motor Company reported the narrowest of sales increases for the Ford brand, as sales edged upward by 0.4 percent for the month. The increase comes as Ford utilized an incentive program to draw in customers. The result is that sales of some of its smallest models, including the Focus fell sharply while sales of F-Series pickup trucks, and its Transit and Transit Connect vans increased. Not all manufacturers submitted sales data as of publication. Volkswagen, however, announced that its sale fell by nearly 25 percent as its inventories fell in the face of a freeze on its diesel-powered models. Volkswagen has yet to announce a fix for the outstanding models affected by the diesel scandal — what could pave the way for production to resume and sales with it. Nissan Rogue sales increased by nearly 50 percent last month. Other manufacturers reporting for the month include Kia (up 1.4 percent), Hyundai (up 12 percent), and Honda (down 5.2 percent). BMW sales rose by 3.2 percent and Mini brand sales fell by 11.3 percent. Mitsubishi sales ended up by 3.6 percent for the month.